Yet another incredibly obscure Falkirk player from the dim and distant past, one nobody else but I has probably heard of, mainly because he did very little for the club. In fact I can only find him playing in one match for the first team, in an end of season Benefit Match for Stenhousemuir FC in 1886/87 [he scored]. 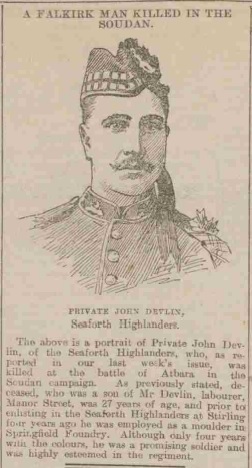 But John Devlin was the first Falkirk FC player that I have found that fell in combat, in the Battle of Atbara, Sudan in 1898. 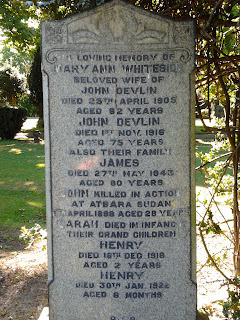 Very little is known of his football career, and it is blurred by there being other players by the name of Devlin playing in minor Falkirk clubs at the time, but it is known that John played for both Falkirk & Falkirk Excelsior, but he may also have played for Falkirk Harp, Black Watch and Erin Rovers [but he would have been very young]. It is known he played for Falkirk because luckily he is in a picture of the Second XI which somehow survived from 1886. 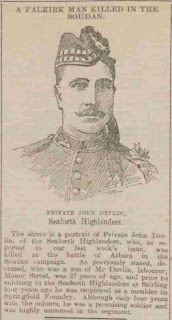 It was also noted in his obituary in the Falkirk Herald that he had won the Falkirk & District Junior Cup with Falkirk Excelsior in 1889 [though it was not mentioned at the time]. 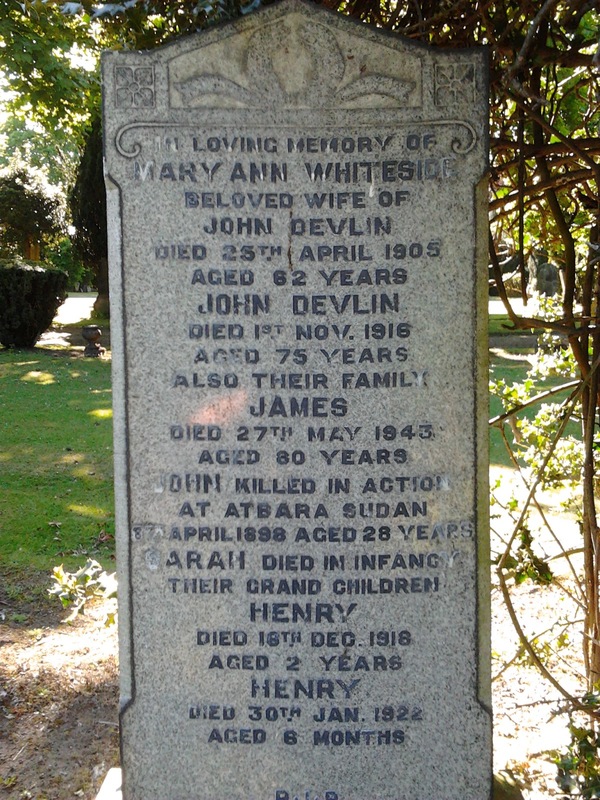 He is honored on the family gravestone in Camelon Cemetery although I do not know whether he is interred there, as he was also commemorated on the British War Memorial in Sudan and the Seaforth Highlanders Memorial in Malta.